Hello to fans of having a big grin plastered across your face – this is the game for you. 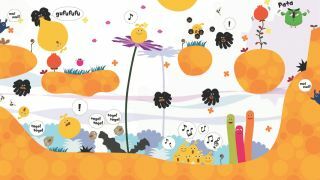 From the first second of watching one of LocoRoco’s tiny heroes roll onto your PSP screen – the delightfully chirpy title music skipping through the speakers as you get stuck in – Sony’s PSP exclusive is focused on making you feel one thing, and one thing only: sheer joy. Back in 2006, owners of Sony’s first portable console were getting used to another feeling: déjà vu. Most handheld exclusives around then tended to be either rejigged PS2 games – such as Burnout Legends and Virtua Tennis World Tour – or reimaginings that struggled to compete with their bigger console brethren. Yep, that’s a sick ten-year-old burn on Metal Gear Ac!d. Original experiences were few and far between, especially ones that utilised the strengths of the tiny ‘Station. But wait. Can someone please tilt forward the LocoRoco? Because in they came to breathe a whole lotta life and originality into the PSP library. The cute little balls with eyes find their planet under attack from the Moja, who, at the start, almost wipe out the LocoRoco. It’s dark stuff for a bright game, with your aim being to rebuild the population by eating fruit – don’t worry, we’ll get to that – and in the process, rid the planet of the pesky Moja blighters. A mix of Super Monkey Ball and Rayman, you never directly control the little blobs, but instead tilt their world. The left shoulder button slants the world in that direction, while the right bumper angles it the other way. To bounce LocoRoco into the air, you press both shoulder buttons at the same time. It’s not a particularly taxing control scheme, but the fun comes from the exquisite level design and puzzles. Stages are filled with secret areas that demand some serious sideways thinking to find, while there’s regular internal high-fiving when you manage to time a jump just right and stacks of collectibles to unearth for those who love to scavenge. It’s also constantly introducing new ideas that change how you approach the game. Take the sticky surfaces that allow you to snub gravity and roll up walls. Or how about the areas that are actually tiny pinball machines, concealing hidden fruit? It’s in these playful moments that LocoRoco really shows why it’s the most delightful game to ever grace the handheld. There’s also the soundtrack – pure Valium in audible form. Everything from the aforementioned title song to your yellow blobs’ theme tune is going to be pinging around your head for days. It leaps from style to style, but always sounds distinctive, weaving naturally through the game. When you come across the giant orange path blockers, for instance, they’ll only move if you unfuse the LocoRoco and watch as they sing in a choir. With levels that can be whizzed through on the bus or scoured in detail when you have more time; mini-games that are more than just amusing diversions; plus a Loco House that adds depth to your collectibles and the ability to keep surprising you from the first world to the last, it’s a huge shame that LocoRoco neither found the audience it deserved, nor enjoyed a full-fat home console adaptation. But PS Vita owners who crave a game like no other have no excuse not to download this classic from the online Store.